Everyone has already told you that you’ll be needing more space – so you moved to that big house in the suburbs. Everyone said you would need a larger car – so you bid a tearful farewell to your beloved sporty three-door, and embraced the people-carrier lifestyle. We know this because a lot of our customers come to us to sell their car for exactly this reason. If you’ve yet to reach this stage, you might want to check out our Best People Carriers for Families. Now you’ve got the house, the car, and hundreds of adorable tiny outfits to dress them up in – you’re probably feeling pretty well prepared… but ask yourself, is your car prepared? 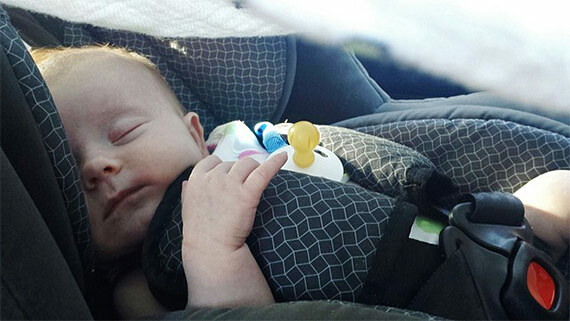 Finding a car seat is no easy task…so make sure you plan ahead and shop around. We wrote all about the different types of car seats in our article Car Seat Safety: Everything You Need to Know. By law, a newborn infant will require a Group 0 rearward-facing baby seat, and this must be purchased from an EU approved manufacturer. The installation side of things can be tricky, remember not all seats will fit all cars. So don’t be shy, ask the experts in the store to help get you kitted and fitted if you’re having trouble. Before you make your purchase, check with a car manual/manufacturer to see which seats are approved for use in your vehicle. Save yourself the stress and hassle of a failed fitting attempt…and that shameful return trip to the store! Consider an Isofix car seat. These incorporate the application of anchor points in your car to allow for easier, safer car seat installation and will reduce the likelihood of mistakes being made. As parents, we all want to teach our children to look on the bright side… just make sure they’re doing it through a sun visor when they’re in the car! It’s a simple fix, but a vital one to have in place. Before the age of 6 months, it’s best to keep them out of direct sunlight. A sun visor will protect them from harsh light rays, and will furthermore add indication to other drivers that you are travelling with an infant, and may encourage sensible driving. It’s always a good idea to keep hats and sunscreen in the car for those spontaneous day trips when the sun is out – although let’s face it, this is Britain. A parent’s need to protect their children is something that can quite easily keep them up at night – or even distract and concern them, when they’re transporting the tots. You can’t put a price on peace of mind, so it’s a good idea to invest in items such as a hammer seatbelt cutter for the glove box. These can be purchased from stores such as Halfords and will allow you to cut through the seatbelts, and break the windows of your car in order to free passengers in the event of an accident. There’s nothing wrong with being prepared! Babies need distractions. Mummies and daddies don’t – especially in the car. Long journeys can be difficult with a baby on board, and when those inevitable tantrums take hold you need a plan of action. If you’re trying to juggle the mechanics of driving whilst attempting to entertain an anti-car baby in the back… you’ll need to get creative. Sing along to some music… babies are soothed by the sound of their parents – however terrible their singing voices are! Remember, they will be facing away from you in the car seat, so not seeing you might be what’s causing their distress. Hearing you will remind them that you are there, and this may help to calm them. Note: when making your music choices – think smooth and soothing, like Adele or Al Green… we can’t imagine baby will thank you if you start blasting Foo Fighters! This one’s a given. Babies are cute – yes. But let’s face it, they’re not exactly the masters of hygiene. Sticky fingers, crumbs and spills are about to become part of your day-to-day routine, and trust us… your car’s upholstery won’t thank you for that. Always keep a pack of wipes stored in the glove box, and you’ll never have to cry over spilled milk! Do you have any suggestions how to prep your car for a new arrival? Make sure you let us know by tweeting @WeWantAnyCar or leave a comment below.